D&C abortions are rather gruesome procedures. They are usually performed in the first 13 weeks of pregnancy, and are one of the most common abortions done in the U.S. According to the doctors who perform them, the babies are often alive the entire time. Haskell: I’ve performed approximately or greater than 40,000 suction curettage [D&C] abortions. Q. When you perform an abortion by the suction curettage method does it ever happen that a portion of the fetus is extracted from the uterus while the fetus is still alive? Q. And how does that happen? For more scientific information, photos, and videos on a baby’s development in the first trimester (and throughout pregnancy), visit The Endowment for Human Development online. Giles testified in the same court case as Haskell. Giles: The fetus in the suction D&C is much smaller, generally less than 12 weeks of gestation, and the fetus either in whole or in part passes through the plastic cannula … and then goes into a suction machine where there’s a gauze bag that then traps the fetal structure and the placental structure as well. Q. Okay. Can the heart of a fetus or embryo still be beating during a suction curettage abortion as the fetus or embryo comes down the cannula? Giles: For a few seconds to a minute, yes. 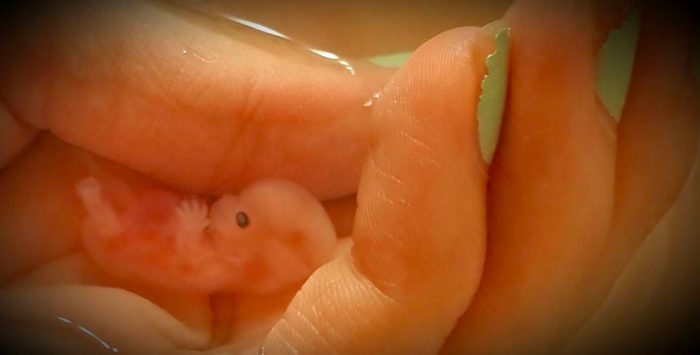 Below is a video of a child’s heart beating at 4.5 weeks gestation. This is two weeks after her heart began to beat. 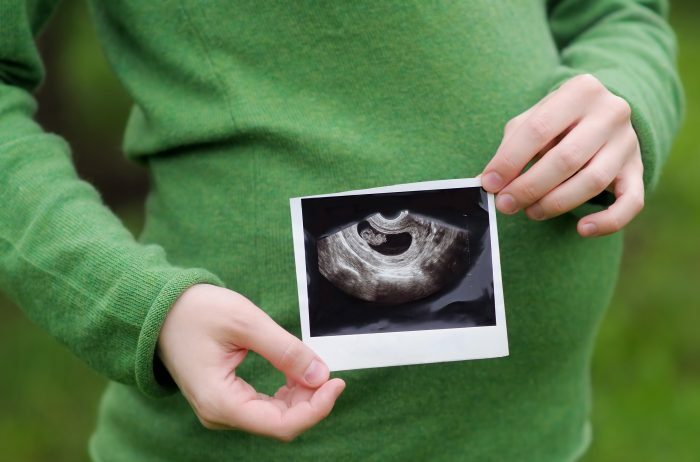 The child’s heart first beats at 18 days gestation, before many women know they are pregnant. 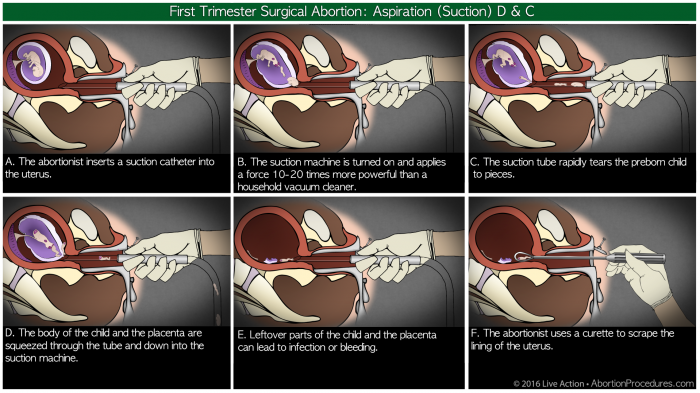 In order to tell you why I finally stopped [performing abortions], I need to explain a little about the technique of suction curettage [D&C] abortion. Incidentally, I did them under general anesthesia in surgery. Today, most are done under local anesthesia in a clinic. First, the cervix, or mouth of the womb, is stretched open with pencil shaped dilators, until it is open enough to insert the suction curette, which is a clear plastic straw like tube. A vacuum source is then attached to the curette. After the curette is introduced into the uterus, the water is broken and is seen through the curette, followed by bits of flesh and blood, which is what remains of the baby and placenta. The procedure works well because the baby is small at 10 weeks and is not calcified, so that it fits easily through the narrow tube. All parts become almost indistinguishable in the mesh filter bag in the suction jar. 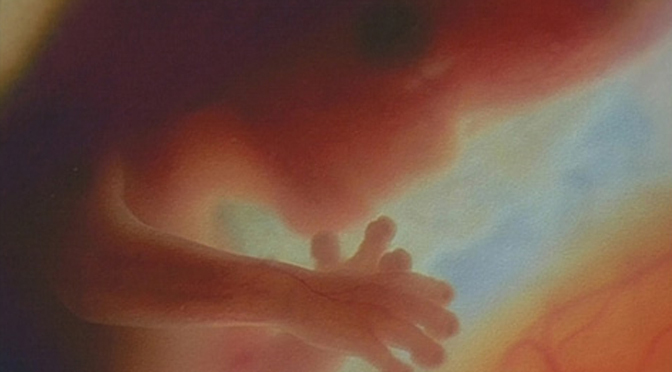 My 23rd abortion changed my mind about doing abortions forever. … Initially, the abortion proceeded normally. The water broke, but then nothing more would come out. When I withdrew the curette, I saw that it was plugged up with the leg of the baby which had been torn off. I then changed techniques and used ring forceps to dismember the 13 or 14 week size baby. Inside the remains of the rib cage I found a tiny, beating heart. I was finally able to remove the head and looked squarely into the face of a human being — a human being that I had just killed. I turned to the scrub nurse standing next to me and said, “I’m sorry”. I knew then that abortion was wrong and I couldn’t be a part of it any longer. … It was then that I asked Jesus Christ to come in to my life and forgive my sins. It was Jesus who forgave me for the murders I had legally committed. It was Jesus who took away the guilt. 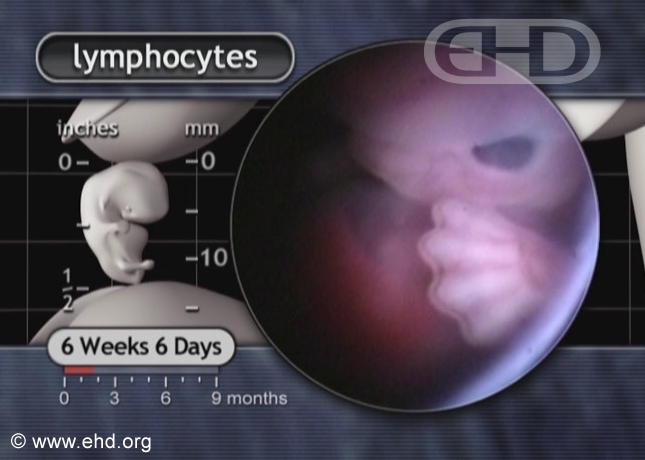 For more information on D&C abortions, watch this video by Dr. Anthony Levatino, a former abortionist, who helps viewers visualize the procedure.